I have recently acquired a glut of TI-82 calculators, along with a handful of TI-83 and TI-83+ calculators. Since I don't need that many duplicates in my personal collection, I'm fixing up most of them and offering them to my Cemetech friends and colleagues. Some, however, call to me for other projects. One TI-82 in particular had extensive motherboard damage that simply wasn't worth my time to fix, though I spent about an hour making progress with it before moving on. I decided that since I also have a few TI-83+ motherboards without LCDs lying around, that I would create a Frankencalculator hybrid of a TI-83+ and a TI-82, and call it a TI-82 Plus. You may be thinking to yourself, "Kerm, how is this different from a simple case-swap, putting the internals of a TI-83+ into a TI-82?" "A valid question," I might say, "and let me answer it." I'm using the TI-82's original case, membrane, battery compartment, and even the original LCD. Luckily, the TI-82 through the TI-84+ all use compatible LCD drivers, so you can interchange LCDs and motherboards from any in those series. 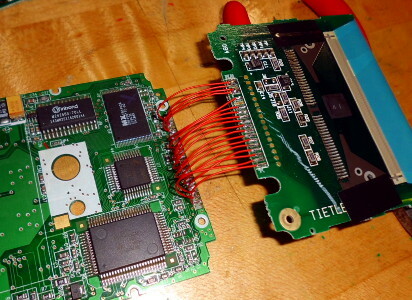 I painstakingly connected the failed TI-82's LCD to one of my TI-83+ motherboards, only to discover that the mainboard was toast. 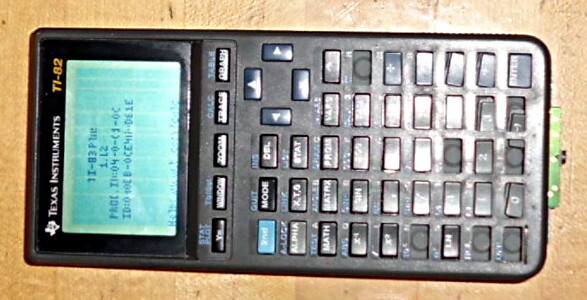 I then decided to cannibalize one of my "new" TI-83+s, which was missing three columns in its LCD. More soldering led me to the result that you see here. That TI-82's LCD does indeed say "TI-83 Plus \ 1.12". You might also notice that the mainboard from the TI-83+'s rounded case is too long to fit the TI-82's squared-off case. I will be cutting off part of the board with a dremel and carefully wiring it to continue to use the TI-82's case's link port aperture. Pictures follow. 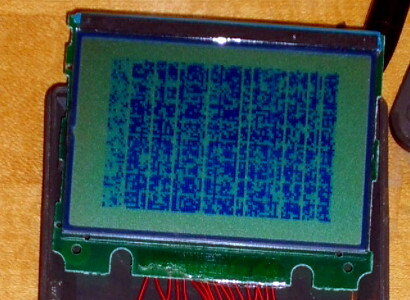 The scrambled screen is an intermediate part of the process, when two of the conductors between the mobo and the LCD were broken. More progress soon. The bottom appears to be the hardest part, along with screw holes. If I somehow manage to convince the TI-83+ hardware to accept a TI-82 OS, will you be happy then? Not that I could do that without extreme work, though you probably could. I'll buy This when it's done another "83+" frankculator would be awesome! Would you be willing to give me a TI-82 (REG!)? Well, I won't be giving them, I will be selling them for a nominal fee to cover the cost I paid for them, my time in fixing them, and shipping, but I'm trying to keep it low so that you guys will be able to get them. What do you plan to do with it? This is pretty hilarious. You should have it be a contest prize, or have a Cemetech auction for it. That's a great idea, I will definitely do one of the two. Man Kerm, I actually wish I had one of these. Looks really really cool to me! But how are you remapping the difference in keys between the two? Also, don't you think you should simply program your own hybrid 82/83+ operating system? I think my admins already know how much I love them. Contest winners and/or Cemetech's hosting bill don't know it, though. Speaking of which, remind me to chip in for hosting when I pick up on moving FreeBuild to the Mac-friendly opensource T3D and free up my monthly subscription to Assembla. Seems like this would have similar results to applying Chameleon on a TI-73. TI-83+ OS, but with a different keypad. Although it definitely takes a lot more work. This seems pretty nice. What I would like to see at one point too is a TI-83 Retro Edition, which would basically be a TI-83 inside a TI-85 case. I don't know if every key can be matched, but aside from blue keys (F1 through F5, arrows, the 4 operations and ENTER), the color layout is similar. You could probably use 82 keys for those. have you considered making a Flash app for the "82+" or chameleon ti 73 that would use a GetKey and rawkey hook to fix the layout for you? it wouldn't be that hard. That would certainly be a good option if needed, especially for the 73-to-83+ conversion. For my "TI-82+", though, the keys match almost exactly, except for the Matrix menu! Any progress on resizing the case yet? And as I mentioned on SAX a few days ago, you should build a TI-82 Plus Silver Edition, and use Emu8x with an 82 ROM. An excellent idea. I'm afraid I've been too busy with stuff to work on this project again. There are 225 users online: 8 members and 217 guests. © Copyright 2000-2019 Cemetech & Christopher Mitchell :: Page Execution Time: 0.219198 seconds.